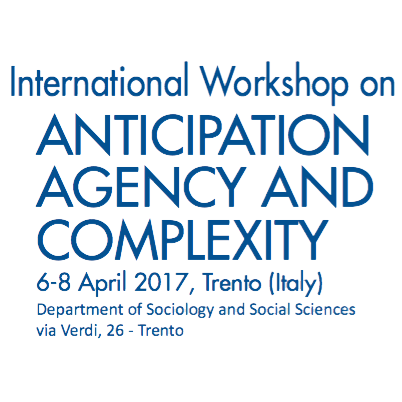 From the 6th to the 8th of April, the International Workshop on Anticipation, Agency and Complexity will take place in Trento (Italy) at the Department of Sociology and Social Sciences. Anticipation is a widespread phenomenon present in and characterizing all types of systems, forcing a re-evaluation of the very idea of science. […] Agency and power are central to how we construct choices and take decisions in complex, anticipatory systems. This conference is a follow up of the First International Conference on Anticipation co-organized by University of Trento, UNESCO, WAAS-World Academy of Art and Science, WUC-World University Consortium and the Advanced Design Network which took place in Trento on November 2016 as an event of project “The UNESCO Chair in Anticipatory Systems”. The first paper is going to be presented by Giulia Tasquier (with an introduction by Olivia Levrini), the second one by Eleonora Barelli.